Cloud storage is the new rage, and almost everyone uses at least one of these services. 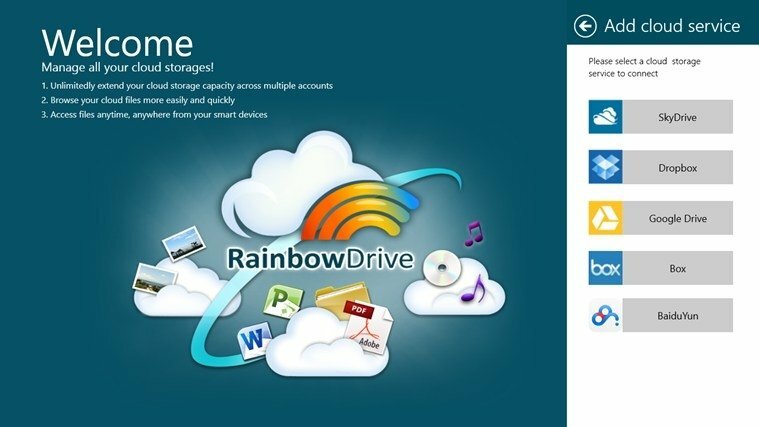 RainbowDrive intends to provide you with an interface to control your different user accounts from a single access point. A boost to your productivity. Forget about switching applications or accounts each time you need to access your files stored online. You'll have total control from this program, with support for multiple accounts and the possibility to upload and download, share or delete files. Integrate the management of Dropbox, Google Drive, OneDrive, Box and BaiduYun. Upload, download, delete or share files. Automatic categorization of files according to their type. Search for files in multiple accounts. Share file links by email. A great tool that will make your work easier and help you to improve your organization. Requires Windows 8.1 or above.